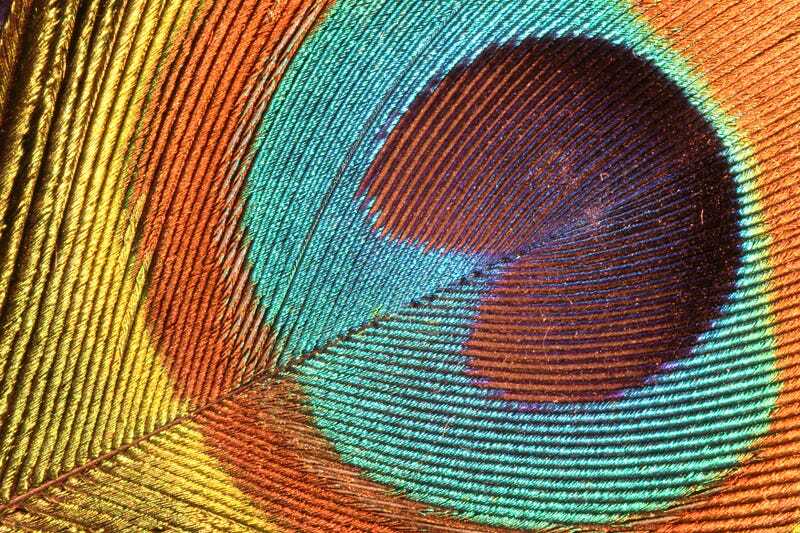 What do a butterfly's shimmering wings, a fish's opalescent scales, and a peacock's brilliant feathers have in common? Yes, their colors are beautifully iridescent. But they are also produced by the physical interaction of light with sophisticated nanoscale architecture that we are only just beginning to understand. Most creatures get their color from pigments and dyes—molecules that absorb certain wavelengths of light while reflecting others. But there's another way that nature cooks up color, by building molecular landscapes that catch and scatter light. Certain organisms are masters of these optical tricks, producing iridescent light shows that make the rest of us look drab. And while colored pigments decompose after death, structural colors—built of the same materials that make up wood, claws or insect exoskeletons—can last for centuries to millennia. All structural colors are produced by optics—physical processes that cause light waves to bend, scatter and interact in specific ways. Often, these tricks involve a change in media. 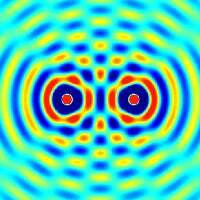 When visible light passes from one substance into another—from air to water, for instance—different component waves bend at different angles; a process physicists call refraction. Refraction can cause two light waves to knock into one another, create a bigger, brighter one. This is called constructive interference, and it is the basis for the most brilliant colors in the natural world. In other instances, waves can interfere destructively, canceling one another out and producing darkness. In nature, organisms build a variety of nanoscopic structures to reflect and refract light in different ways. A diffraction grating is one of the most common. This is a surface with grooves that bend light, often between two different media, guiding interactions between specific waves. The peacock's exquisite tail feathers and butterfly's iridescent wing colors are both, at their most fundamental scale, variations on this theme. Structural colors possess another quality, being the result of physical interactions rather than intrinsic chemical properties. Sometimes, the color we perceive coming off these light chambers changes depending on the angle of perception. When this happens, it produces the phenomenon we call iridescence. This quality is found in everything from oil slicks to opals to oyster shells, and it is always equally dazzling. The first color-building life forms probably date back to the Cambrian explosion over 500 million years ago. This was a period of rapid evolutionary advancement, during which eyes evolved from simple light sensors to neurologically sophisticated organs that could detect color, shade and contrast. Biologists believe that the spread of complex vision kicked off an evolutionary arms race between predator and prey species, resulting in a plethora of colorful displays intended to distract, avoid or communicate. Structural color has since evolved independently many times across the tree of life, and is found today in plants, fish, insects, birds, and even a handful of mammals. Color-by-structure is more than just eye candy. Nature's brightest have discovered that optical tricks can afford many advantages, some of which have nothing at all to do with beauty or appearance. Now, some of these millennia-old colorful designs are fueling a new wave of biologically-inspired innovation. We all know that colorful garb can be used to attract a mate, but ironically, it can also make you hard to see. This works best underwater, which is great news for all the fish that'd like to avoid becoming lunch. Silvery sardines and herring, for instance, are among the shiniest creatures in the world, thanks to layers of highly reflective guanine crystals embedded in their skin cells. By mixing two types of crystals that have different refractive properties, these fish ensure that a broad band of incoming light is reflected, affording them a silvery glow. In clear, open water, these scales reflect light equally from all angles, turning the fish into near-perfect mirrors. The true masters of undersea invisibility, however, are cephalopods—squid, cuttlefish and octopi. Certain species, such as the octopus Japetella heathi, remain constantly cloaked by changing their camouflage strategy depending on the brightness of their environment. When sunlight streams in from above, light passes through their skin unchecked, rendering the animals see-through. When their world darkens, their skin darkens to match. Shu Yang, a professor of materials science at the University of Pennsylvania whose designs often draw inspiration from nature, is fascinated by this underwater invisibility cloak. She explained to me how transparent cephalopods actually contain tiny pigment cells within their skin. When contracted, these pigments are small enough that light passes them by. But when the octopus stretches, the pigments elongate into light-reflecting shields. If this mechanism could be replicated artificially, Yang believes it could revolutionize energy-efficiency in buildings. A material that becomes more or less transparent depending on the light intensity could, for instance, be applied to windows, allowing extra sunlight to filter on cooler days, while blocking incoming light when the temperature rises. Her research group is working to develop the first synthetic material—a stretchy, rubbery substance filled with light-bending nanoparticles—designed to do just that. Few color-builders have received as much admiration as the iridescent butterflies. These insects' wing colors are built from microscopic scales, consisting of an upper and a lower lamina linked together by pillars. Embedded within these scales are melanins—pigments that create black and brown undertones. As light scatters within a scale's crystalline structure, it produces iridescent blues, greens and reds. The result is some of the most complex and multi-dimensional color displays on Earth. But for the insects, scales serve an purpose far more important than beauty: Staying dry. The upper surface of the wing scales is formed by parallel ridges that jut out at angles, creating a nano-roughness. When water hits these surfaces, it balls up and rolls away. As it does so, it picks up any debris it encounters in its path, keeping the wings clean. For butterflies, this self-cleaning and drying mechanism is critical—otherwise, the delicate wings would become water-logged and useless. The wings scales are also fascinating to materials scientists, being one of the most water-repellant substances on Earth. Several years ago, Yang's group designed a spray coating that mimics the light-bending and water repelling properties of butterfly wings. When the spray is applied to a surface, nanoscopic particles add an invisible layer of roughness that causes water droplets to literally bounce away like rubber balls. The coating, Yang says, may one day be used to create cleaner, drier and more efficient solar panels, buildings and displays. We can't talk about color and evolutionary cleverness without mentioning plants, some of which may use iridescence to increase their power supply. Selaginella willdenowii is a tropical spike moss whose leaves possess a blue-green shimmer when it's young or growing in the shade, but loses the quality as it ages or is exposed to high light. This iridescence is achieved by cells in the leaves' upper epidermis, which are packed with pillars of cellulose and filled with different amounts of water. One theory suggests the scattering of light within cellulose fibers allows the plant to net more of the sun's long-wave radiation. The plant may "turn off" its iridescence in high light by changing the water content of its leaves' cell walls. That is, this particular display of color may have nothing to do with appearance, and everything to do with energy. The jury's still out on whether this plant's shimmer has an adaptive advantage, or is simply an evolutionary byproduct. If, however, iridescently blue leaves—found across the plant kingdom—can offer clues toward better solar efficiency, researchers should take note. Once we unlock the secrets that make plants the world's best solar engines, we'll be that much closer to living off Earth's most abundant free energy source. Structural color has been around for hundreds of millions of years, but its only in the last several decades that we've had the tools to peer into the world at the nanoscale and actually start to understand it. We may still be infants when it comes to building colors for ourselves, but in the future, who knows what sorts of colorful tech will emerge? Will iridescent, water-proof skin be a status symbol? Will our cityscapes lighten and darken as the sun moves across the sky? Maybe, for a pretty penny, we'll even be able to purchase an honest-to-goodness Invisibility Cloak — and that's going to open up a giant can of worms. The future, it would appear, is both beautiful and terrifying. For daily science geekery, follow Maddie Stone on Twitter .